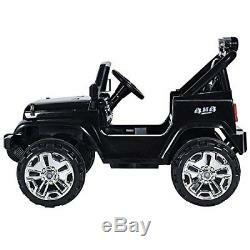 Costzon Kids Ride On Jeep Truck Car 12V Remote Control Vehicle with Twin Moto.. Costzon Kids Ride On Jeep Truck Car 12V Remote Control Vehicle with Twin Motor LED Lights Music MP3 (Black). Parental Remote Control Mode: You can control this Truck to enjoy the happiness of being together with your baby. 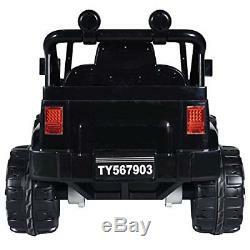 Battery Operate Mode: Your baby can operate this Truck by himself/herself by electric foot pedal and steering wheel. With 212V motors, it can reach up to 6km/h. When this Truck is fully charged, your baby can continuously play it by 40 minutes which makes sure that your baby can abundantly enjoy it. Comfortable seat with safety belt provides large space for your baby to sit (the safety belt enclosed is only as a substance to increase children's safety awareness, please keep an eye to your baby when he/she is playing). Equipped with wing mirrors, horn, LED headlights, music, volume control, forward / backward switch. Your baby can get on/off free with the doors that can be open/closed. Please drive it on flat surface for better enjoyment. It is really a cool Jeep! Product Size: 43.3"L x 29.5"W x 26.4H. Suitable for children between 37 months-96 months old. Speed: 3-6 Km/h, Weight Capacity: 66 lbs. 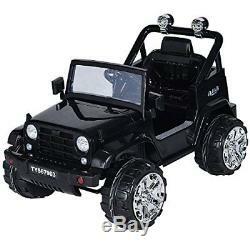 Description: An ideal ride on Jeep car for your children! Two modes are available to control this car for more flexibility. When this car is fully charged, your baby can continuously play it by 40 minutes which makes sure that your baby can abundantly enjoy it. Equipped with MP3 input, movable wing mirrors, horn, working headlights, high/low speed switch. Features: Strong power, two motors With music, horn, LED headlights, MP3, volume control Forward / Backward switch Wing mirrors With parental remote control Suitable for children from 37 months-96 months Drives on plat surface. Specification: Color: Black Main material: plastic Product Dimensions :43.3"L x 29.5"W x 26.4H Net Weight: about 37lbs Carrying capacity:66 lbs Power mode: Rechargeable Battery:12V 7AH Charger: 12V 1000MA Charging time:8-12 hours Power life: 280 times charging Motor: Twin 12V motors Speed: 3/6km/hr. 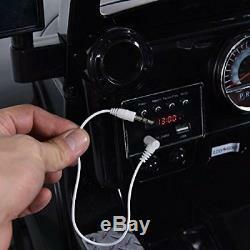 Package Includes: 1 x Ride on Jeep car 1 x Remote control 1 x Charger 1x Operation Manual. Any product you return must be in the same condition you received it and in the original packaging. We usually respond within 24 hours on weekdays. Thank you for shopping at our store. 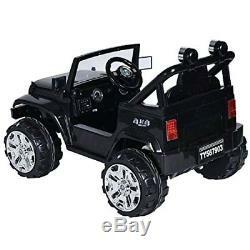 Costzon Kids Ride On Jeep Truck Car 12V Remote Control Vehicle with Twin Motor LED Lights Music MP3 (Black) --- Two Modes: 1.-- With 212V motors, it can reach up to 6km/h. -- Comfortable seat with safety belt provides large space for your baby to sit (the safety belt enclosed is only as a substance to increase children's safety awareness, please keep an eye to your baby when he/she is playing). 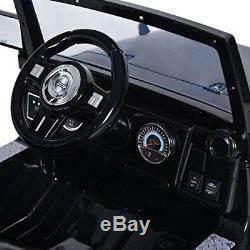 -- Equipped with wing mirrors, horn, LED headlights, music, volume control, forward / backward switch. -- Product Size: 43.3"L x 29.5"W x 26.4H. --Any product you return must be in the same condition you received it and in the original packaging. 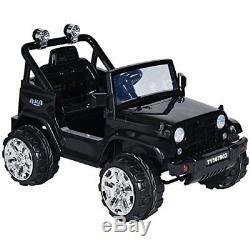 The item "Costzon Kids Ride On Jeep Truck Car 12V Remote Control Vehicle with Twin Moto" is in sale since Monday, September 17, 2018. This item is in the category "Toys & Hobbies\Electronic, Battery & Wind-Up\Battery Operated\1990-Now\Ride On Toys & Accessories". The seller is "drormess" and is located in New york. This item can be shipped worldwide.